Please note: the original publication of this story, Why 'Guardians of the Galaxy' Could Land Among August's Biggest Hits Ever', was first published on July 24. Sunday Update: Guardians of the Galaxy arrived with a bang this weekend with a stronger than expected estimated start of $94.0 million. The 3D sci-fi superhero film from Disney and Marvel soared past pre-release expectations which had tended to range anywhere from $65 million to $80 million. Without adjusting for ticket price inflation, Guardians of the Galaxy easily set a new opening record for the month of August. The previous high-mark was the $69.28 million debut of The Bourne Ultimatum back in 2007. It should be noted that when adjusting for ticket price inflation, Guardians of the Galaxy does rank slightly behind the $97.2 million adjusted debut of Rush Hour 2 (which opened with an actual gross of $67.41 million in 2001). Guardians of the Galaxy delivered the third largest opening weekend performance of 2014 to date (behind only Transformers: Age of Extinction and Captain America: The Winter Solider). That Guardians of the Galaxy was able to open nearly on par with the $95.02 million debut of Captain America: The Winter Soldier, despite being a non-sequel based on a far less known pre-established property is quite the achievement and is a very strong sign for future Disney and Marvel projects heading into the future. Guardians of the Galaxy opened with $37.8 million on Friday (which included a strong $11.2 million from Thursday evening shows), fell 18 percent on Saturday to take in $31.0 million and is estimated to decline 19 percent on Sunday to gross $25.2 million. That gives the film an estimated opening weekend to Friday ratio of 2.49 to 1. Guardians of the Galaxy will hope to hold up well going forward thanks to very strong critical reviews and strong early word of mouth (the film received an A rating on CinemaScore). However, it is still very possible that the film could be front-loaded given the nature of comic book adaptations in general and a number of new films that will provide direct competition in the weeks ahead (including Teenage Mutant Ninja Turtles, Let's Be Cops and The Expendables 3). The audience breakdown for Guardians of the Galaxy skewed towards male moviegoers (56 percent) and towards moviegoers over the age of 25 (55 percent). Family audiences represented 26 percent of the film's overall audience. 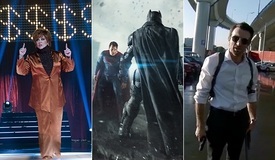 3D grosses represented 45 percent of the film's overall gross this weekend. Universal's Lucy placed in a distant second this weekend with an estimated $18.3 million. The modestly budgeted sci-fi action film starring Scarlett Johansson was down a sharp 58 percent from last weekend. Lucy was obviously hurt in a big way by the break-out performance of Guardians of the Galaxy and the film's lukewarm word of mouth didn't help matters either this weekend. With that said, Lucy continues to exceed expectations nicely with a strong ten-day start of $79.59 million. 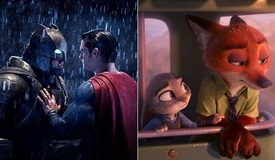 That places the film 12 percent ahead of the $71.03 million ten-day take of 2010's Salt (which fell 46 percent in its second weekend to gross $19.47 million). Fellow Universal release Get on Up opened in third with an estimated $14.0 million. The James Brown biopic starring Chadwick Boseman opened below expectations, as it too was likely hurt a bit by the breakout start of Guardians of the Galaxy. Get on Up was unable to excite moviegoers anywhere near to the same extent as last year's 42 (which also starred Boseman). Get on Up debuted 49 percent softer than the $27.49 million debut of 42. Get on Up started up with $4.9 million on Friday, increased 6 percent to gross $5.2 million on Saturday and is estimated to decline 25 percent on Sunday to gross $3.9 million. That places the film's estimated opening weekend to Friday ratio at 2.86 to 1. The audience breakdown for Get on Up skewed towards female moviegoers (63 percent) and heavily towards moviegoers 25 years and older (90 percent). The film will hope that largely positive reviews and a strong A rating on CinemaScore will help lead to strong holding power going forward. On the heels of last weekend's stronger than expected start, Hercules tumbled in its second weekend with an estimated fourth place take of $10.7 million. The Dwayne Johnson led 3D action-adventure film from Paramount and MGM was down a very sharp 64 percent from last weekend. While Hercules was always extremely likely to be front-loaded to begin with, the competition from Guardians of the Galaxy obviously took an extra toll on the film. Hercules does continue to perform ahead of its relatively modest expectations with a ten-day start of $52.35 million. But this weekend's hold is a troubling sign going forward, especially with the already mentioned upcoming direct competition on the horizon. Fox's Dawn of the Planet of the Apes rounded out the weekend's top five with an estimated $8.7 million. The critically acclaimed 3D sci-fi action sequel was down 48 percent. Despite strong word of mouth, Dawn of the Planet of the Apes has taken a hit from all of the new direct competition the past two weeks. In the bigger picture, Dawn of the Planet of the Apes continues to perform well with a 24-day take of $189.33 million. That leaves the film $10.67 million away from reaching the $200 million domestic milestone and places the film an impressive 27 percent ahead of the $148.67 million 24-day take of 2011's Rise of the Planet of the Apes. Saturday Update: Disney reports that Guardians of the Galaxy bowed to a stellar $37.8 million on Friday, positioning the flick to earn upward of $95 million this weekend. For full perspective, that tops Captain America: The First Avenger's $25.7 million first day in July 2011 by a whopping 47 percent, while also exceeding Thor: The Dark World's $31.9 million by 18.5 percent, and Captain America: The Winter Soldier's $36.9 million by over 2 percent. Guardians only trails Godzilla ($38.4 million) and Transformers: Age of Extinction ($41.9 million) as the third best opening day of the year. For those curious, falling "short" of Transformers 4's opening day take despite posting a stronger Thursday night gross ($11.2 million versus $8.8 million) is generally irrelevant. Marvel's core fan audience creates an inherently stronger rush-out factor, particularly with a film like Guardians whose overwhelmingly positive buzz had been growing well in advance. There can be no exaggeration: this opening further cements the drawing power of the Marvel brand name, while simultaneously launching another sub-franchise for their cinematic universe. It also marks another major milestone for budding star Chris Pratt following The LEGO Movie. This weekend's success should also be good news for Universal's Jurassic World next summer, which Pratt leads. As their tenth entry in the overall MCU saga, Marvel gambled with a cast of completely unknown characters and an off-beat action/humor hybrid that had many inside and outside the industry suspecting the film could be their first miss at the box office. Obviously, and as BoxOffice had been forecasting since the first trailer launched, that didn't come to pass. Still, like any great box office stories, the size of this debut is one that virtually no one saw coming just a few short months ago. Early word of mouth appears to be as strong as the film's reviews, boasting a 96 percent Flixster score and 92 percent Rotten Tomatoes score as of Saturday morning. The former edges out Winter Soldier and X-Men: Days of Future Past (95 percent each) to claim the best day-after-release score of the year. August looks somewhat busier than usual this year, but there's little doubt that Guardians will play well through (and perhaps beyond) the end of summer. Meanwhile, Universal's Get On Up opened to $5 million on Friday. While that's notably 40 percent behind Lee Daniels' The Butler's $8.3 million first day last August, the James Brown biopic almost certainly lost out on some of the young adult crowd to Guardians. With a 77 percent Flixster score and 76 percent Rotten Tomatoes score, healthy legs should be expected for the counter-programming adult option. 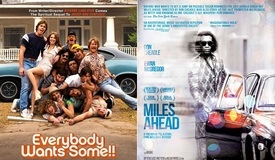 BoxOffice projects a $14.9 million weekend. Check BoxOffice on Sunday morning as Daniel Garris reports the studio's official weekend estimates. Friday Update #2: Multiple sources are reporting that Guardians of the Galaxy is pacing for a huge $38-40 million opening day (including Thursday night's preview grosses). If that number holds, and based on strong early word of mouth, we could be looking at the year's second $100 million opening weekend. Please note that these are very early unconfirmed numbers, and West Coast evening business has only just begun as of this update's publishing. Either way, $90 million+ for what's shaping up to be the box office story of the summer (if not the year) looks like a certainty right now. Meanwhile, Get On Up reportedly could land around $15 million this weekend based on early reports. Check BoxOffice tomorrow morning for official Friday studio estimates and more concrete weekend projections. Friday, August 1 Update: Sources report that Guardians of the Galaxy amassed a stunning $11.2 million from Thursday shows that began at 7pm. That tops Captain America: The Winter Soldier's $10.2 million Thursday start, giving Guardians the best early bow of 2014. While it's likely that this feat was aided by schools being out of session this time of year, there's no doubt that Disney and Marvel have a huge hit on their hands--not to mention a new A-list sub-franchise in the Marvel Cinematic Universe. Check back later today for early Friday numbers. Wednesday, July 30 Update: Fandango reports that Guardians of the Galaxy is pacing to become 2014's top non-sequel pre-seller, as well as their best August pre-seller in company history. Read the press release here. Meanwhile, a Disney source tells BoxOffice they are estimating an opening weekend around $65 million. Thursday night preview shows begin at 7pm. Guardians of the Galaxy, arguably Marvel Studios' riskiest adaptation to hit the big screen yet, is one week away. 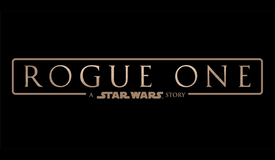 A new trailer (below) dropped recently, IMAX's 17-minute preview went over well, and it's a foregone conclusion that the studio's Comic-Con panel this Saturday will prominently feature the pic as they induce one final surge of pre-release buzz among the target audience. Marvel started the summer with a bang in Captain America: The Winter Soldier (presently the year's top box office earner with over $258 million), and now they aim to bookend that success with another potential franchise-starter, which happens to be the final entry of the Marvel Cinematic Universe's Phase 2 before Avengers: Age of Ultron hits theaters next May. Will moviegoers show up, or will the experiment cater strictly to a niche crowd? Disney and Marvel are both cognizant that this film, a pivotal point for the MCU's creative direction into other-worldly stories and characters, has a big question mark hovering overhead in terms of commercial viability. This is a young property by comic standards (the film's character lineup was first published in 2008, although the concept itself dates back to a 1969 team--since abandoned), and there's no Robert Downey, Jr. to boost interest among non-fans. One can't help but guess at intentional self-reference in the trailer as Rocket Raccoon (an inevitable crowd favorite) admits, "This might not be the best idea." The film does, however, boast a budding star in Chris Pratt (TV's Parks and Recreation, The LEGO Movie, next year's Jurassic World) as he takes on the lead of Peter "Star-Lord" Quill--a roguish Earth native who comes to lead the motley crew of title characters. Sci-fi good luck charm Zoe Saldana (Star Trek, Avatar) and marquee voice contributions from Bradley Cooper and Vin Diesel further serve as the cast's celebrity credentials--not to mention a deep roster of veteran supporting players in Glenn Close, Benicio del Toro, John C. Reilly, Djimon Hounsou, Josh Brolin, Lee Pace, Karen Gillan, Peter Serafinowicz, and mixed martial artist Dave Batista. More than its eclectic cast, though, Guardians of the Galaxy offers a unique approach to the comic book movie pantheon, and a fun, comedic tone not unlike a cross between Star Wars and Iron Man. To that end, Pratt's Star-Lord hopes to join the mantle of cinematic swag led by gents such as Jack Sparrow, Tony Stark, James T. Kirk, Han Solo, and... Marty McFly? A blend of the latter two 80s icons was cited by Marvel mastermind Kevin Feige as his vision for Pratt's character. After all, audiences love a bad boy--especially one they can empathize with. For the uninitiated, Disney's marketing machine has successfully pitched Guardians as a combination of swashbuckling adventure, visually striking locales and visuals, and even a few hints of romance to help entice the girls (although a shirtless Pratt may already have that handled). If the film balances these elements around a story-driven core, you can bet the term "crowd-pleaser" will be thrown around frequently in the days and weeks ahead. The last few months have shown that, despite some quality films and positive word of mouth, audiences are looking for more than your commonplace summer fare. Remember when 2007's Transformers rose to the occasion and earned $319 million domestically, nearly stealing the summer crown from the presumed "Big Three" of Spider-Man 3, Shrek the Third, and Pirates of the Caribbean: At World's End? Don't be shocked if Guardians carves out a similar place in history here in 2014. August has rarely been known to deliver on such hopes, though. 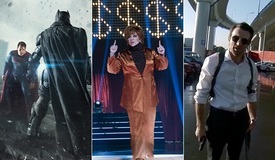 Despite its share of box office hits over the years, the last month of the season has only generated four films to gross over $200 million domestically--and the last was seven years ago (The Bourne Ultimatum, $227.5 million). Before that, 2002's Signs ($228 million) and 2001's Rush Hour 2 ($226 million) earned similar blockbuster numbers. 1999's The Sixth Sense still holds the monthly crown ($293.5 million). In terms of opening weekend, just five films have bowed higher than $50 million in August--and all of them were under $70 million. Considering Marvel has only launched a movie below $65 million on opening weekend once in nine tries (The Incredible Hulk, $55 million), there's reason to speculate that Guardians could set the new benchmark. While the argument stands that a property like this isn't as instantly familiar among general audiences as Thor ($66 million) or Captain America ($65 million) prior to their big screen debuts, Marvel's success since The Avengers has bolstered their brand recognition far outside the core fan base. Case in point: social media has driven Guardians' early buzz in a big way--partly thanks to director James Gunn's interaction and personal updates throughout production. The first trailer lit Twitter ablaze with its unapologetic quirk, and the film is now the subject of more tweets than The Amazing Spider-Man 2 at the same point before release. It's not far behind Winter Soldier and X-Men: Days of Future Past, either. Ultimately, word of mouth will determine whether or not Marvel Studios' tenth effort can exceed $200 million in North America and join the upper echelon of this summer's box office performers. Rumors of a production budget around $170 million persist, meaning a worldwide take of at least $425-450 million is needed to ensure a profitable theatrical run. That shouldn't be a difficult hurdle to climb with the booming overseas market, 3D surcharges, and Marvel's global appeal. 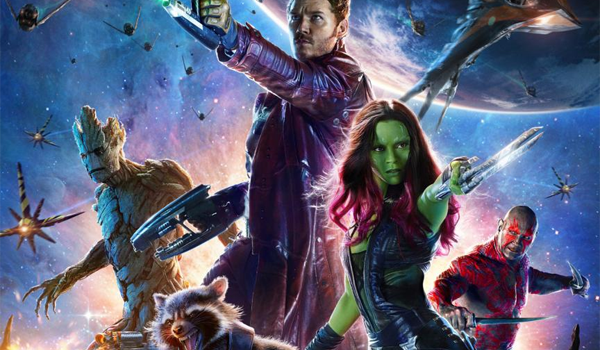 Indeed, signs are favoring Guardians of the Galaxy to be one of the studio's best ideas yet.